You asked us, is it true that we have taste buds in our stomachs? Not only do we have taste receptors on our tongues and in our tummies, they're showing up in our intestines and lungs. But let's go back a few steps. There are thousands of taste buds in our mouths, each with 50 to 150 cells that sense chemicals. Eat something sweet or salty, bitter, sour or full of umami meaty goodness and these receptor cells send signals to our brain telling us what we're tasting. A similar chemical detection system is at play in other parts of our body, where receptors are on the lookout for specific tastes, like bitter or sweet. We don't yet have a good understanding of what most of these taste receptors do or how they work, but we're getting closer. And unlocking these mysteries could lead to new treatments for conditions like diabetes, asthma and even infertility. That sounds pretty sweet to my ears. Critical thinking challenge: How do we know where our taste buds are? We know where our taste buds are because they are basically everywhere in our body, and they send signals to our brains telling us what we are tasting and whether we like it or not. WOW!!!!! I can't believe we have taste buds on our stomachs too. It also shows in our intestines and lungs. I also can't believe 50-150 cells that are sense chemicals. We know where our taste buds are because of doctors doing continuous tests about these kinds of things and asking what senses that we have. Some people even believe we have a sixth sense. we know where our taste buds are bc when a food that is sour or sweet is consumed, your taste buds send a signal to your brain. People started asking if we have taste buds in our stomach and research shows that we have them in our intestines and lungs. We don't fully understand how these go into play with our bodies, but if we do it could cure numerous diseases like infertility, asthma, and diabetes. I cant believe that theirs taste buds in your stomach. Its confusing how it works but also very interesting. Kiwi is really good. Its super sweet. I like the color of it too. They're really small and round. Kiwi's are hairy too. This article talked about whether or not we have taste buds in our stomachs. Its is true and we don't only have them on our tongues and bellies. Recent studies have shown that they are also showing up in our intestines and lungs. 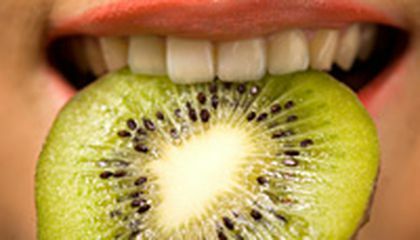 Scientists believe that finding more research on taste buds will help with conditions involving food. I think that this is very cool.